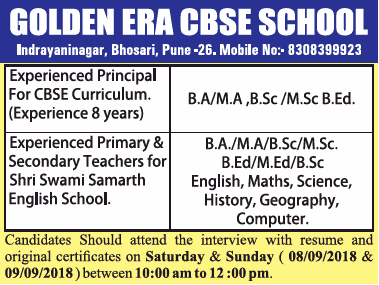 Golden ERA CBSE School, Pune has advertised in THE TIMES OF INDIA newspaper for recruitment of Teachers / Principal jobs vacancies. Interested and eligible job aspirants are requested to walk-in on 08th and 09th Sept 2018. Check out further more details below. About School: Pupils at Golden Era School gain much more than just the formal curriculum. They have a broader perspective of the World and learn to take on the World in a positive manner with great degree of ease. GES provides solid approach to learning. How to Apply: Interested and eligible candidates are requested to attend the Walk-in interview along with CV, originals & copies of certificates, PAN card, Aadhaar card and recent passport size photo to the walk-in address given below.